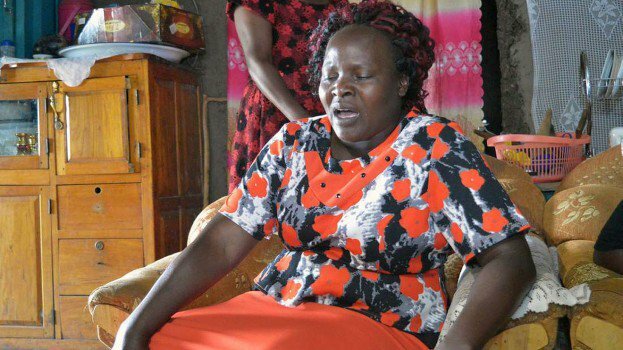 Sunday October 14, 2018-Mother to slain University of Rongo student, Sharon Otieno, is demanding Sh 3.5 milliom from well wishers to help her educate the 3 children that were left by her daughter. Sharon, 26, was killed by Migori Governor , Okoth Obado who is currently in remand at the Industrial Area Prison. Sharon was the clandestine lover of the governor and she was seven month pregnant with her child. When she was killed, Sharon was the breadwinner of the family and she had 3 children from her previous marriage. Now Sharon’s mother, Melida Auma expressed her worries regarding the future of the children, thus the family's decision to act with speed to raise the funds. "Sharon left the children at a very tender age and it is going to be hard for me to educate them well,” she told journalists on Friday. Melida added that Sharon's killing remains fresh in her mind, considering that she was her eldest daughter, roughly over a month after her demise. "I am yet to come to terms with the loss and still wondering how I will take care of the three children she left behind,” she said.